It has been a LONG winter here in Atlanta. Winter is NOT my favorite season. So, I have been doing a lot of hibernating lately and cooking up comfort food. Whenever I see a recipe featuring polenta I get the urge to make a big pot. Polenta screams comfort food to me. 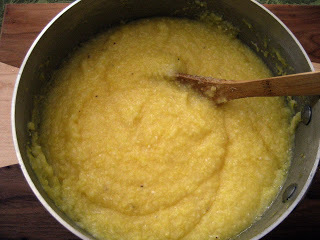 (no, I am not Italian) Just this last week it seemed polenta was featured everywhere I looked-New York Times, POLENTA, Los Angeles Times,POLENTA, even when I was flipping through the Silver Palate Cookbook, The New Basics, POLENTA. The NY Times version featured Mark Bittman (I adore him) making a stove top version, I made it. (if you haven’t check out the NY Times Food section on Wednesdays and Mark Bittman’s video recipe clips, they are the best). Then I brought up the LA Times food section online and polenta again. Russ Parsons, another favorite, shared his oven baked version. I tried that one too. The Silver Palate, The New Basics polenta was a little different, it was made with milk. You guessed it, I made that one too, creating a casserole with polenta, sausage and tomato layers. After making 3 different versions of polenta in one week, I did have my favorite, the oven baked method from the LA Times. 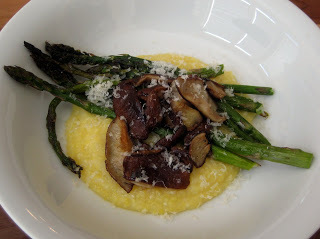 Winter hibernation 2010 lunch, a big pot of oven polenta, roasted green asparagus, and sauteed shiitake mushrooms. Real food, real simple and SOOO delicious. My version of winter meets spring. Now, I just hope spring starts winning out over winter, sooner then later. 1. Heat oven to 350 F. In a 3-4 qt oven proof pot combine water, salt, butter and corn grits. Bake uncovered for 1 hour and 20 minutes. 2. Stir polenta and bake for another 10-15 minutes or until polenta is the consistency desired. 3. Remove pot from oven and stir in Parmesan cheese. Let rest for 5 minutes.